LS-0942-BG-S - Bust xs31-33 inches s33-35 inches m35-37 inches L38-40 inches XL40-42 inches. Sleeve length shoulder to cuff hem xs25 inches S25 inches M25. 5 inches l26 inches XL26. 5 inches. Model in pictures is 5 feet 8-10 inches 173-178cm tall wearing size S. Model in pictures is 5 feet 8-10 inches 173-178cm tall wearing size S.
Length shoulder to bottom hem xs28 inches S28 inches M28. 5 inches l29 inches XL29. 5 inches. Garment care: machine washable. Fabric: 95% rayon 5% Spandex. Pattyboutik cowl neck Long Sleeve Stretch Causal Blouse Tunic Knit Top. Please choose your size based on bust measurement below. - Bust s33-35 inches m35-37 inches l38-40 inches XL40-42 inches. Lengthshoulder to bottom hem S29 inches M30 inches L305 inches XL31. 5 inches. Fabric: 95% viscose 5% Nylon. Garment care: machine washable. Model in pictures is 5 feet 8 inches 173cm tall. Model in pictures is 5 feet 8 inches 173cm tall. Pattyboutik cowl neck long Sleeve Ruched Sides Stretch Pullover Blouse Tunic Sweater. Please choose your size based on bust measurement below. Sleeve lengthshoulder to cuff hem S25 inches M25. 5 inches l26 inches XL26. 5 inches. - Model in pictures is 5 feet 8-10 inches 173-178cm tall wearing size S. Please choose your size based on bust measurement below. Garment care: machine washable. Length shoulder to bottom hem xs305 inches S305 inches m31 inches L32 inches XL32. 5 inches. Fabric: 95% viscose 5% Nylon. Sleeve lengthshoulder to cuff hem S25 inches M25. 5 inches l26 inches XL26. 5 inches. Sleeve length shoulder to cuff hem xs25. 5 inches S25. 5 inches m26 inches L26. 5 inches XL27 inches. Garment care: machine washable. Bust xs31-33 inches s33-35 inches m35-37 inches L38-40 inches XL40-42 inches. Lengthshoulder to bottom hem S29 inches M30 inches L305 inches XL31. 5 inches. PattyBoutik Women V Neck Ribbed Tunic Knit Top - Pattyboutik v neck ribbed Long Sleeve Sweater Tunic Knit Top. Model in pictures is 5 feet 8 inches 173cm tall. Please choose your size based on bust measurement below. - Bust xs31-33 inches s33-35 inches m35-37 inches L38-40 inches XL40-42 inches. Sleeve lengthshoulder to cuff hem S25 inches M25. 5 inches l26 inches XL26. 5 inches. Fabric: 95% viscose 5% Nylon. Model in pictures is 5 feet 8 inches 173cm tall wearing size S. Garment care: machine washable. Please choose your size based on bust measurement below. Garment care: machine washable. Garment care: machine washable. Sleeve length shoulder to cuff hem xs25. 5 inches S25. 5 inches m26 inches L26. 5 inches XL27 inches. Length shoulder to bottom hem xs305 inches S305 inches m31 inches L32 inches XL32. 5 inches. Model in pictures is 5 feet 8 inches 173cm tall. Please choose your size based on bust measurement below. PattyBoutik Women Turtleneck Long Sleeve Sweater - Please choose your size based on bust measurement below. Sleeve length shoulder to cuff hem xs25 inches S25 inches M25. 5 inches l26 inches XL26. - Model in pictures is 5 feet 8-10 inches 173-178cm tall wearing size S. Please choose your size based on bust measurement below. Bust s33-35 inches m35-37 inches l38-40 inches XL40-42 inches. Model in pictures is 5 feet 8-10 inches 173-178cm tall wearing size S. Bust xs31-33 inches s33-35 inches m35-37 inches L38-40 inches XL40-42 inches. Fabric: 95% viscose 5% Nylon. Model in pictures is 5 feet 8 inches 173cm tall wearing size S. Garment care: machine washable. Length shoulder to bottom hem xs31. 5 inches S31. 5 inches m32 inches L33 inches XL33. 5 inches. Cotton blend zip collar Long Sleeve Kangaroo Pocket Curve Hem Tunic Top. Please choose your size based on bust measurement below. PattyBoutik Women's Zip Pocket Tunic - . Model in pictures is 5 feet 8-10 inches 173-178cm tall wearing size S. Model in pictures is 5 feet 8 inches 173cm tall. Please choose your size based on bust measurement below. Sleeve lengthshoulder to cuff hem S25 inches M25. - Bust s33-35 inches m35-37 inches l38-40 inches XL40-42 inches. Model in pictures is 5 feet 8 inches 173cm tall. Please choose your size based on bust measurement below. Fabric: 95% viscose 5% Nylon. Fabric: 30% cotton 70% Polyester. Garment care: machine washable. Sleeve length shoulder to cuff hem xs25. 5 inches S25. 5 inches m26 inches L26. 5 inches XL27 inches. Sleeve lengthshoulder to cuff hem S25 inches M25. 5 inches l26 inches XL26. 5 inches. Length shoulder to bottom hem xs31. 5 inches S31. 5 inches m32 inches L33 inches XL33. 5 inches. Model in pictures is 5 feet 8-10 inches 173-178cm tall wearing size S. Fabric: 95% viscose 5% Nylon. PattyBoutik Women's Raglan V Neck Ruched Sides Top - Sleeve lengthshoulder to cuff hem S25 inches M25. 5 inches l26 inches XL26. 5 inches. Please choose your size based on bust measurement below. - Model in pictures is 5 feet 8 inches 173cm tall. Please choose your size based on bust measurement below. Model in pictures is 5 feet 8-10 inches 173-178cm tall wearing size S. Bust s33-35 inches m35-37 inches l38-40 inches XL40-42 inches. Garment care: machine washable. Garment care: machine washable. Model in pictures is 5 feet 8-10 inches 173-178cm tall wearing size S.
Bust s33-35 inches m35-37 inches l38-40 inches XL40-42 inches. Model in pictures is 5 feet 8 inches 173cm tall wearing size S. Garment care: machine washable. Fabric: 30% cotton 70% Polyester. Bust s33-35 inches m35-37 inches l38-40 inches XL40-42 inches. Lengthshoulder to bottom hem S24 inches M25 inches L25. 5 inches XL26. PattyBoutik Women V Neck Empire Waist Knit Top - 5 inches. Sleeve lengthshoulder to cuff hem S25 inches M25. 5 inches l26 inches XL26. 5 inches. Fabric: 95% cotton 5% Spandex. Sleeve length shoulder to cuff hem xs25. - Please choose your size based on bust measurement below. Fabric: 65% polyester 35% Cotton. Model in pictures is 5 feet 8-10 inches 173-178cm tall wearing size S. Lengthshoulder to bottom hem S29 inches M30 inches L305 inches XL31. 5 inches. Bust s33-35 inches m35-37 inches l38-40 inches XL40-42 inches. Model in pictures is 5 feet 8-10 inches 173-178cm tall wearing size S.
Model in pictures is 5 feet 8-10 inches 173-178cm tall wearing size S. Sleeve length shoulder to cuff hem xs25 inches S25 inches M25. 5 inches l26 inches XL26. 5 inches. Please choose your size based on bust measurement below. Length shoulder to bottom hem xs27 inches S27 inches M27. 5 inches L28. 5 inches XL29 inches. PattyBoutik Women's Shawl Collar Pleated Detail Blouse - Garment care: machine washable. Garment care: machine washable. Model in pictures is 5 feet 8-10 inches 173-178cm tall wearing size S. Please choose your size based on bust measurement below. Length shoulder to bottom hem xs23. - Model in pictures is 5 feet 8-10 inches 173-178cm tall wearing size S. Garment care: machine washable. Sleeve length shoulder to cuff hem xs25 inches S25 inches M25. 5 inches l26 inches XL26. 5 inches. Fabric: 95% viscose 5% Nylon. Sleeve length shoulder to cuff hem xs25 inches S25 inches M25. 5 inches l26 inches XL26. 5 inches. Garment care: machine washable. Garment care: machine washable. Please choose your size based on bust measurement below. Length shoulder to bottom hem xs27. 5 inches S27. 5 inches m28 inches L29 inches XL29. 5 inches. Bust xs31-33 inches s33-35 inches m35-37 inches L38-40 inches XL40-42 inches. Sleeve length shoulder to cuff hem xs26 inches S26 inches M26. PattyBoutik Women's Drawstring Cowl Neck Raglan Blouse - 5 inches l27 inches XL27. 5 inches. Model in pictures is 5 feet 8 inches 173cm tall wearing size S. Pattyboutik color block Drawstring Cowl Neck Raglan Long Sleeve Kangaroo Pocket Blouse. Sleeve lengthshoulder to cuff hem S25 inches M25. - Model in pictures is 5 feet 8 inches 173cm tall wearing size S. Lengthshoulder to bottom hem S23. 5 inches m24 inches L25 inches XL25. 5 inches. Please choose your size based on bust measurement below. Garment care: machine washable. Fabric: 95% viscose 5% Nylon. Bust xs31-33 inches s33-35 inches m35-37 inches L38-40 inches XL40-42 inches. Bust xs31-33 inches s33-35 inches m35-37 inches L38-40 inches XL40-42 inches. Model in pictures is 5 feet 8-10 inches 173-178cm tall wearing size S. Please choose your size based on bust measurement below. Fabric: 30% cotton 70% Polyester. Fabric: 94% rayon 6% Spandex. Fabric: 95% cotton 5% Spandex. Sleeve length shoulder to cuff hem xs25. PattyBoutik Women's Boat Neck Raglan 3/4 Sleeve Blouse - 5 inches S25. 5 inches m26 inches L26. 5 inches XL27 inches. Please choose your size based on bust measurement below. Sleeve length shoulder to cuff hem xs26 inches S26 inches M26. 5 inches l27 inches XL27. - Fabric: 95% viscose 5% Nylon. Garment care: machine washable. Please choose your size based on bust measurement below. Bust xs31-33 inches s33-35 inches m35-37 inches L38-40 inches XL40-42 inches. Please choose your size based on bust measurement below. Sleeve lengthshoulder to cuff hem S25 inches M25. 5 inches l26 inches XL26. 5 inches. Sleeve length shoulder to cuff hem xs27. 5 inches s28 inches M28. 5 inches l29 inches XL29. 5 inches. Length shoulder to bottom hem xs31. 5 inches S31. 5 inches m32 inches L33 inches XL33. 5 inches. Fabric: 30% cotton 70% Polyester. Lengthshoulder to bottom hem S27 inches M28 inches L28. 5 inches XL29. 5 inches. Garment care: machine washable. 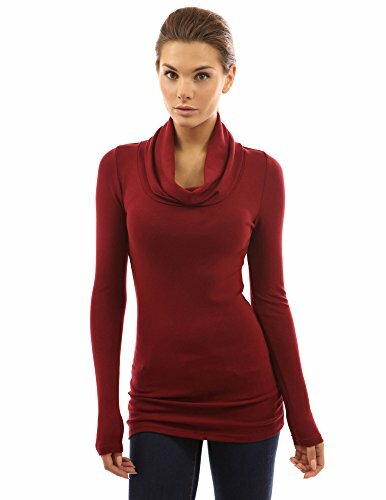 PattyBoutik Women's V Neck Long Sleeve Tunic Sweater - Garment care: machine washable. Fabric: 95% viscose 5% Nylon.